Bishop Salvatore Cordileone has endorsed a federal bill which seeks a religious exemption for opponents of gay marriage. 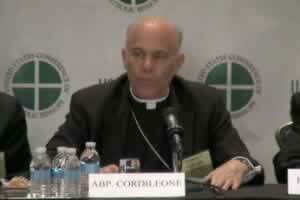 Cordileone, who leads the United States Conference of Catholic Bishops' (USCCB) Subcommittee for the Promotion and Defense of Marriage and heads the diocese of San Francisco, made his endorsement Monday during a presentation at the U.S. bishops' fall general meeting in Baltimore. Cordileone criticized the federal government's decision to recognize the legal marriages of gay and lesbian couples following a U.S. Supreme Court ruling knocking down a portion of the Defense of Marriage Act (DOMA). “The Supreme Court's DOMA decision is now being used to judicially challenge marriage laws in more than a dozen states that still recognize marriage as the union of one man and one woman,” Cordileone was quoted as saying by The Catholic Sun. He also denounced the recent passage in the Senate of the Employment Non-Discrimination Act (ENDA), which seeks to outlaw workplace discrimination on the basis of sexual orientation and gender identity. Cordileone advocated for passage of the Marriage and Religious Freedom Act as a possible “remedy” to the court's DOMA decision and passage in the Senate of ENDA. Idaho Rep. Raul Labrador, a Tea Party-backed Republican, in September introduced the bill, which has 85 co-sponsors. Cordileone noted the case of a photographer found to have violated the New Mexico Human Rights Act when she refused to photograph a lesbian couple's commitment ceremony in 2006, claiming that it violated her faith. The case is currently on appeal to the U.S. Supreme Court.